Mt. 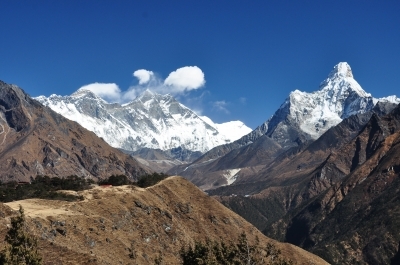 Everest, the mountain of all mountains, is every hikers dream destination. It is one of man's greatest challenges and yet draws thousands risking life and limb to reach it's glorious summit. But for many, just a glimpse of this imposing mountain is worth the long journey. A hike to Mt. 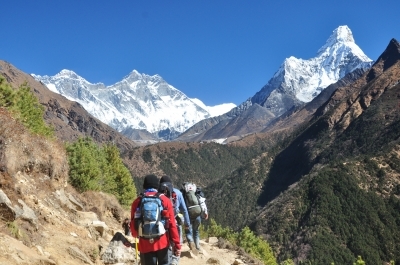 Everest Base Camp (EBC) is a hike of a lifetime with it's trails passing through the beauty of the himalayan mountains and of Nepalese culture. During this journey we will pass by imposing snow covered peaks, cross dangling hanging bridges, see raging rivers and waterfalls. We will also be given a chance to know a little about the local way of life as our night's and a few days will be spent in local villages with it's traditional coffee shops, religous structures and even monateries still being used. 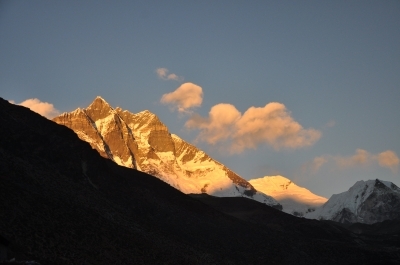 We have crafted an itinerary that gives everyone a high success rate to reach the Everest Base Camp! 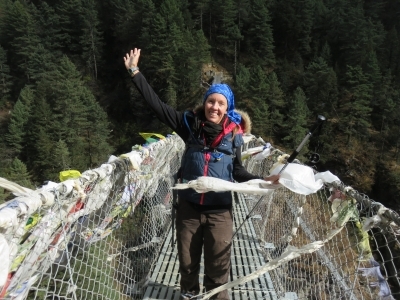 Join Trail Adventours on it's 18 day hike to the Everest Base Camp and let's have an adventure of a lifetime. Three nights’ accommodation with breakfast at a 3 star category hotel in Kathmandu. 01:00 AM (Oct 27) Depart for Kathmandu. 05:00 PM (Oct 28) Arrival in Kathmandu. Head to Thamel. Check in at hotel. Explore Kathmandu. 04:30 AM (Oct 29) Wake up call and Breakfast. 05:30 AM Depart for Airport. 08:00 AM Fly to Lukla. 08:45 AM Arrive at Lukla. 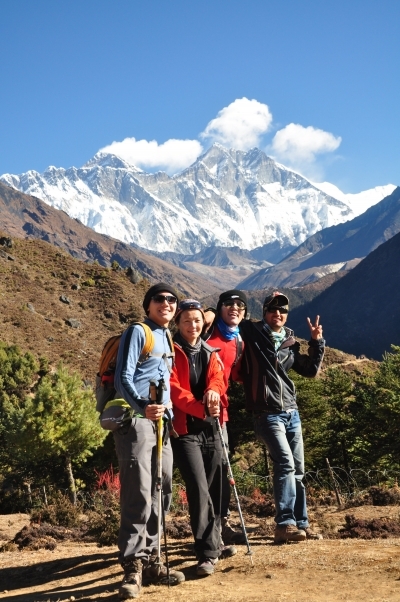 Meet local guides and porters. Last minute preparations. 09:30 AM Start trek to Phakding. 12:00 PM Lunch along the trail. 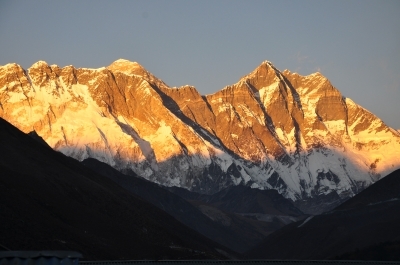 02:00 PM Arrive at Phakding (2,652MASL). Settle down. Rest or explore the area. 06:00 AM (Oct 30) Wake up call and breakfast. 07:00 AM Start hike to Namche Bazaar. 12:00 PM Lunch along the trails. 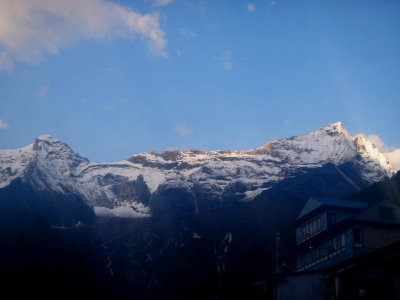 03:30 PM Arrive at Namche Bazzar(3,440MASL). Settle down. Explore street shops. 07:00 AM (Oct 31) Breakfast. Prepare for acclimatization hike. 08:00 AM Start Trek to Everest View Hotel and Khumjung. Catch a glimpse of Mt. Everest along the way. 12:00 PM Back at Namche Bazaar for lunch or option to extend walk and eat in other guest house. 01:00 PM Rest or continue stroll at Namche Bazaar. 06:30 PM Dinner. Lights out. 07:00 AM (Nov 1) Wake up call and breakfast. 06:00 AM (Nov 2) Wake up call and breakfast. 06:00 AM (Nov 3) Wake up call and breakfast. 06:00 AM (Nov 4) Wake up call and breakfast. 07:00 AM Start trek to Tuklha. 12:00 PM Arrival at Tukhla. Lunch. 02:00 PM Acclimatize. 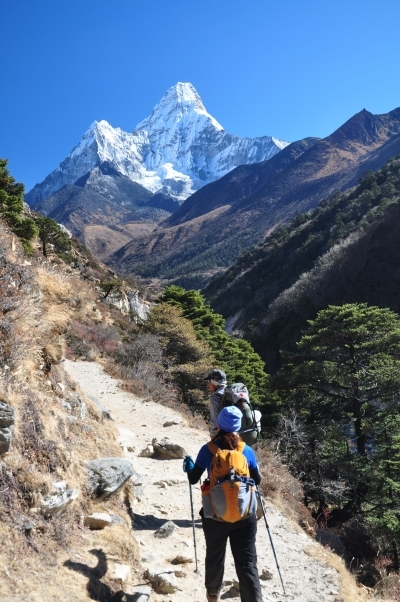 Hike around the area and descend back to Tuklha. 05:00 AM (Nov 5) Wake up call and breakfast. 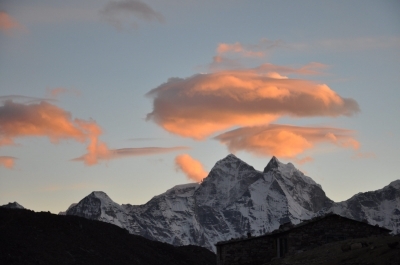 07:00 AM Start trek to Lobuche. 12:00 PM Arrive at Lobuche(4,910MASL). Settle down. Lunch. 05:00 AM (Nov 6) Wake up call and breakfast. 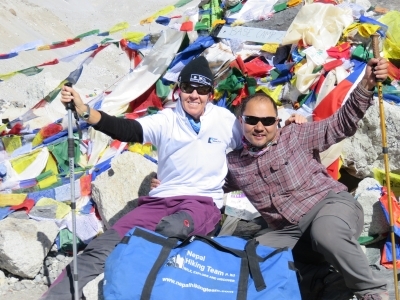 Everest Base Camp day! 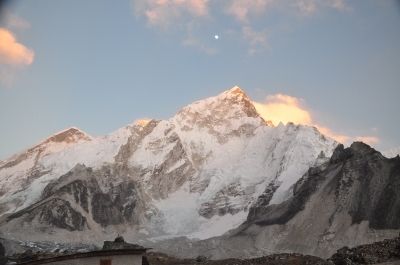 06:00 AM Start trek to Everest Base Camp. 11:00 AM Arrive at Gorakshep (5,181 MASL). 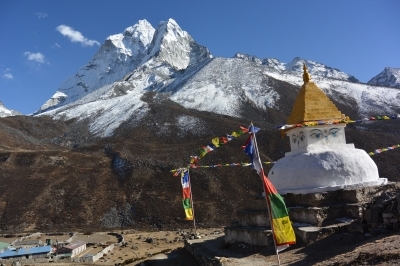 Continue trek to Everest Base Camp. Early Lunch. 02:00 PM Arrive at Everest Base Camp. Rest and explore the area. 03:00 PM Start descent back to Gorakshep. 05:30 PM Arrive at Gorakshep. Settle down. 04:30 AM (Nov 7) Wake up call and breakfast. 05:30 AM Start Trek to Kalapathar and Pheriche. 08:00 AM Arrive at Kalapathar(5,545). Enjoy view of Mt. Everest. 12:00 PM Lunch along the way. 05:00 PM Arrive at Pheriche (4,210MASL) Settle down. 06:00 AM (Nov 8) Wake up call and breakfast. 07:00 AM Start descent to Namche Bazaar. 04:00 PM Arrive at Namche Bazaar. Settle down. 06:00 AM (Nov 9) Wake up call and breakfast. 07:00 AM Start trek to Lukla. Lunch along the trail. 04:00 PM Arrive at Lukla. Settle down. 07:00 AM (Nov 10) Wake up call and breakfast. 10:00 AM Fly back to Kathmandu. 12:00 PM Arrive back in Kathmandu. Free time to explore the place. 11:00 AM (Nov 12) Depart Kathmandu. 04:00 PM (Nov 13) Arrival in Manila. *A more detailed "Things to bring" will be discussed during our preparation climb meeting. As of the moment, we only offer this trip as a scheduled trip. Please check the "SCHEDULES" link for details. Package Rate: USD 1,650 or PHP 88,000/person for scheduled hikes.